The Roma Moulding Toronto Team is proud to have completed the ALS Ice Bucket Challenge! 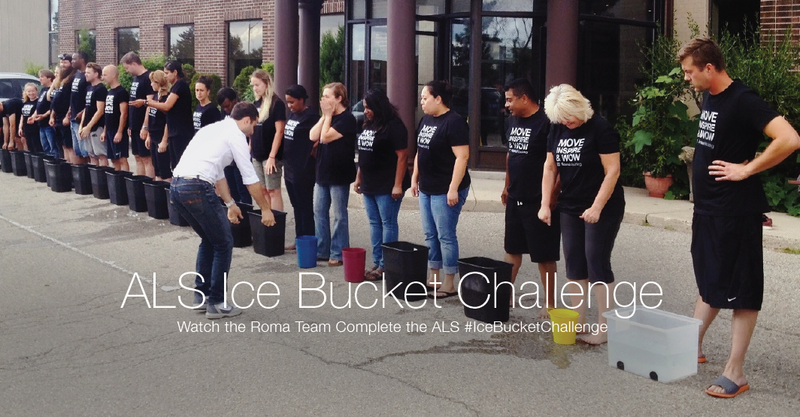 In total, 22 Roma Team members participated in the ALS Ice Bucket Challenge, which aimed to raise funds and awareness for amyotrophic lateral sclerosis. Roma Moulding made a donation that will to go towards the $79.7 million that has been raised as of August 25 for ALS. The Roma Moulding Team was nominated by Roma Moulding CEO, Tony Gareri who knew his team would step up to the challenge. For more information on the ALS Ice Bucket Challenge, please click here. Roma Moulding – ALS Ice Bucket Challenge from Roma Moulding on Vimeo. “Iâ€™d really like to own an ulmlo-catfortabre, ultra-durable pair of ballet flats I can wear all the time and abuse to death, but Iâ€™m satisfied with these for now.”If you find one, please let us know where to buy it 😛 Topshop flats are super comfy but durable = meh. Which is sad because it’s f’ expensive.